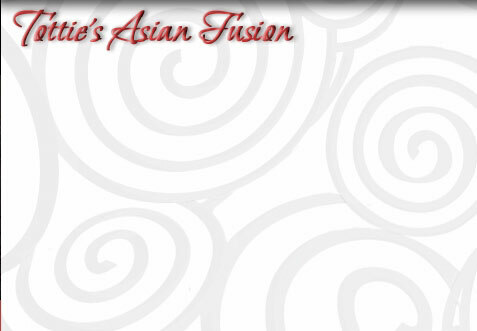 A defining destination for authentic Asian fare - Tottie's Asian Fusion brings together the best of Thai, Vietnamese, Chinese and Japanese (sushi) cuisines. Chef and owner Tottie Kaya breathes a fresh new appeal into the definition of "fusion"; here it means patrons can experience the signature dishes of each of these four dynamic cuisines under one roof and all at approachable prices. Ms. Kaya comes by her tradition-based Asian recipes and culinary skills naturally. Raised in a multi-cultural environment, Ms. Kaya cut her teeth on professional cooking at a tender age; her mother was a renowned caterer in Laos who trained her children early on. Patrons to Tottie's Asian Fusion benefit from these impeccable credentials; menu items like Pad Thai, Vietnamese egg rolls (called Tottie Rolls), Pork Dumplings and Shanghai Pan Fried Noodles resonate with authentic character. True to the foundation of this family-oriented culinary background, the restaurant is as welcoming to families as it is enticing for trendy epicureans. Patrons looking for the healthiest alternatives can choose from a range of specialty dishes created by Ms. Kaya that suit their special dietary needs. Don't-miss options include Fuji Salad of organic greens with grated fuji apple, grilled meat or tofu and light ginger dressing, or the Laotian Treasure Platter of crisp vegetables and coconut infused chowder. Other dishes like Pad Thai or Bun Tom can be ordered without noodles to accommodate low-carb food plans. This award-winning restaurant also features an eclectic array of Japanese delicacies created by celebrated sushi chef, Chef Taka, during dinner hours. Prepared with a master's precision, these ocean-fresh offerings appeal to both sushi purists and trendy gourmands - every evening Chef Taka-san can be found crafting exceptional native offerings alongside dazzling contemporary creations. In early 2009, this successful four-year old restaurant underwent a major expansion; the now-spacious interior of warm earth tones pops with the addition of a 6-foot crystal dragon and eye-appealing chic dècor. Graciously sized booths easily accommodate 6 while generous banquet seating is perfect for larger parties. Come evening, the focal point becomes the sleek, ebony sushi bar, which adds yet another dimension of culinary drama to this exceptional Asian eatery. 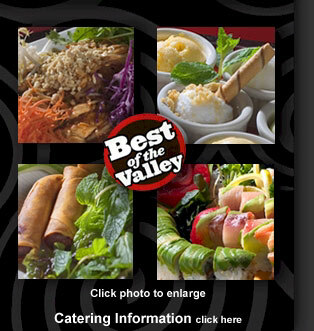 Scottsdale's must-experience Asian dining destination!